Important materials have been distributed to Governors Village property owners regarding the upcoming 2017 Annual Meeting and other announcements. Documents are attached below. Please note our management company Tallis Management changed its name to Towne Properties Raleigh District effective October 1, 2017. The company was purchased in 2015 by Towne Properties. On Tuesday, November 28, 2017 at 7:00 PM the Governors Village Property Owners Association (POA) will hold its Annual Meeting at Mount Carmel Baptist Church located at 2016 Mt. Carmel Church Road Chapel Hill, NC 27517. Please mark your calendar now so you will be able to attend this important meeting in order to exercise your rights and responsibilities as a property owner. Sign-in will begin at 6:30 PM. Please complete the enclosed proxy and return it to us, so if a last minute change prevents you from attending, the quorum requirements needed to conduct business can still be met. If you send in your proxy and do attend the meeting, the proxy will be returned to you at the time you sign-in. In order to meet quorum, proxies must be returned to us no later than 5:30 PM on Monday, November 27, 2017. This return date will allow us to prepare for an orderly registration. Proxies will not be accepted at the door. Thank you and we look forward to seeing you at the November 28th Annual Meeting. Governors Village Property Owners Association, Inc. There is currently no candidate for the Village Seat. This entry was posted in gv POA Business and tagged annual meeting, budget, proxy on November 17, 2017 by govvillage. A Governors Village In Depth article by Susie Moffat, Communication Committee. Designed to be of interest to new and long-term residents alike, this occasional series is aimed at exploring and explaining how our community operates. With the Annual Property Owners Meeting coming up in November this seems like a good time to reissue an In Depth article originally published in 2016 describing some key points about the Governors Village Property Owners Association (GVPOA). The next GVPOA meeting is the Annual Meeting, scheduled for Tuesday, November 28, 2017. Meeting details and slate of candidates have not been announced yet for this year, but the meetings are usually held at Mount Carmel Baptist Church with sign-in beginning at 6:30 PM. Owners are encouraged to mark calendars to attend this important meeting in order to exercise their rights and responsibilities as property owners. At the annual meeting property owners have an opportunity to vote to fill open board seats. Board members provide an update on the past year’s activities, improvements, and plans; present a financial report, including the budget for the new year; recognize volunteers and welcome new residents; and answer questions from the owners. Ahead of the annual meeting, here is a refresher on how this community is structured. POA 101. What Is Governors Village POA? A property owners association (POA) is an organization established to govern a private community. Homeowners in this community are automatically members of the master Governors Village Property Owners Association (GVPOA or POA). GVPOA is governed by a board of directors elected by its members and a set of rules called bylaws. What Constitutes Governors Village Community? Six neighborhoods comprise the community of Governors Village: the eponymous Governors Village, along with Governors Park, Governors Forest, Governors Lake, Townes of Governors Village and Camden Governors Village Apartments. The last two neighborhoods may bear further explanation. Camden Governors Village Apartments has separate ownership, management and amenities from the rest of the Governors Village community, but as described in the bylaws is represented with one director’s seat on the community’s governing board. The Townes neighborhood is a sub-association. Legally known as Townes of Governors Village Maintenance Association, it is a separate corporation, has its own officers and holds its own annual meeting in the fall for the homeowners. Within the Townes neighborhood, there are two sections of townhomes, the Townes and the Lake Townes. The neighborhood’s owners pay dues to both the Townes sub-association and to the master Governors Village Property Owners Association (GVPOA). They contribute the same dues to GVPOA as other neighborhoods, with additional monthly dues to run the townhome association. While there are some areas of overlap between the townhomes sub-association and the master association, there are other areas, such as repainting of townhomes, that are not shared. As part of the master Governors Village Property Owners Association (GVPOA), the Townes has one director seat on the GVPOA Board. Its owners are eligible for the three at-large directors on that board as well. How Are GVPOA Board of Directors Chosen? As mentioned earlier, GVPOA is governed by a board of directors elected by its members and a set of rules called bylaws. There are nine seats on the board. The apartment (Camden Governors Village Apartments) owner member is entitled to elect one director. Historically the apartment property manager has filled this position. The remaining eight residential members of the POA board are elected to three-year terms by the community’s homeowners during the annual meeting, usually held in November. These elected board members donate many hours of service to managing and improving the community. Each of the neighborhoods (Forest, Lake, Park, Townes, Village) has one (1) director seat, and there are three (3) at-large directors who can be from any of the neighborhoods. Three seats come up for election every year. No director may be elected to more than two consecutive three-year terms. Directors must be owners, but none is required to be a resident of North Carolina. Board members elect officers at their first board of directors meeting each year. As set out in the bylaws, the business and affairs of the master association are managed by its Board of Directors. A guiding strategy set by the POA Board in 2008 described this mission. The Governors Village Property Owners Association, through the oversight and authority of its board, is responsible for beautifying common areas, providing community activities and amenities, the design and enforcement of protective covenants and, as a result of these activities, protecting property values. Board meetings are conducted by the board president. In addition to overseeing budgeted items, the POA Board considers proposals from the different committees and homeowners for projects that are not budgeted, but which add value to the community. Other projects correcting community problems are discussed and when necessary, the management company (Talis) is requested to obtain proposals for the POA Board’s evaluation. The board usually meets on the third Thursday of odd-numbered months at the Community Room, Camden Governors Village at 6:30 pm. Meeting schedules are subject to change, but the management company can confirm their time and place. Upcoming meetings and agendas usually are published on the community website. Residents are welcome to attend board meetings. Each meeting includes a homeowners forum during which residents may speak. The GVPOA governing documents, including the Bylaws and the Covenants, are located on the Documents page, along with a summary of POA rules and regulations. Minutes from GVPOA Board of Directors are published on this website and on the management company website once they have been approved by each member. Governors Village In Depth is sponsored by Governors Village Communication Committee. This entry was posted in gv In Depth, gv POA Business and tagged annual meeting, Governors Village In Depth, poa on October 13, 2017 by govvillage. Minutes from this year’s annual membership meeting which took place November 1, 2016 are now available. This entry was posted in gv POA Board Minutes and Summaries, gv POA Business and tagged annual meeting on November 28, 2016 by govvillage. 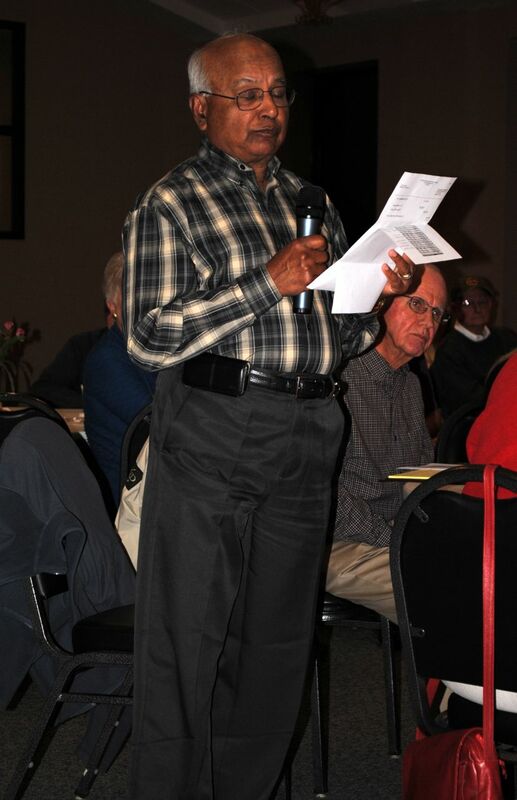 On Tuesday, November 1, 2016, about 50 Governors Village residents assembled for the 2016 annual meeting of the Property Owners Association (POA) to hear an update by the current board, to vote on three open positions and to participate in an open question and answer session. Nominees for the three open Board of Directors positions ran unopposed for re-election and all were approved by voice vote to serve again for three-year terms. They are: Daniel Guy – 30133 Porter for the Park Seat; Bill Hlavac – 12010 Wicker for Lake Seat and Cliff Simpson – 30171 Pharr for At-Large Seat. Since the three candidates had already been in these positions, the board membership remains the same for 2017. 2016 and also 2017 Governors Village Board of Directors. Pictured just before the start of the Annual Property Owners Meeting, left to right: Cliff Simpson, Daniel Guy, Wes Weaver, Ted Smith, Kalyan Ghosh, Bill Hlavac, John Eberhard. Not pictured: Adele McLean, LaVerne Blankenship. Board members welcomed new residents to the community and asked them to stand. They also thanked Alina Cochran and Danielle Flippo of Talis for their work during the year and recognized the contributions of Governors Village community volunteers who chair various committees. The presentation included updates on grounds (including plans to pilot an organic approach to landscape management) and financial reports. During the Q&A session residents raised concerns about the pool management company (inattentive pool attendants and broken equipment for the saline treatment not reported in timely fashion by the company) and inappropriate behaviors by residents themselves (ongoing issues of glass containers at the pool, diving from the pool deck). Among other issues some included interest in adding screen door to a Townes front door (approval would require change to covenants); pesticide use; clarification of structure of Townes Board responsibilities with regard to landscape maintenance contract (Townes and main GVPOA typically use same company but have separate contracts); a request to release POA Board minutes promptly (board releases them as soon as they can be approved); and, request for update on replacing fitness equipment at lake (scheduled to be completely redone this fall). See attachments for the board’s slide presentation. Also available are photos from the past year’s activities. This entry was posted in gv Photos, gv POA Business and tagged annual meeting on November 2, 2016 by govvillage. On Tuesday, November 1, 2016 at 7:00 PM the Governors Village Property Owners Association (POA) will hold its Annual Meeting at Mount Carmel Baptist Church. Sign-in begins at 6:30 PM. Please mark your calendar now so you will be able to attend this important meeting in order to exercise your rights and responsibilities as a property owner. At this meeting, three Board of Directors positions are up for election. The three nominees all currently hold seats on the board: Daniel Guy – 30133 Porter for the Park Seat; Bill Hlavac – 12010 Wicker for Lake Seat and Cliff Simpson – 30171 Pharr for At-Large Seat. Information on these three individuals is included below. Also attached is a copy of the 2017 Budget as approved by the Board of Directors. The annual assessment for 2017 will increase by $20 per year from $1,020 to $1,040 per year in 2017. The budget will be reviewed at the Annual Meeting. Please see attached notice below for complete meeting details. Please complete the enclosed proxy and return it to Talis so if a last minute change prevents you from attending, the quorum requirements needed to conduct business can still be met. Proxies will not be accepted at the door. This entry was posted in gv POA Board Minutes and Summaries, gv POA Business and tagged annual meeting, budget, pos board nominees on October 27, 2016 by govvillage. 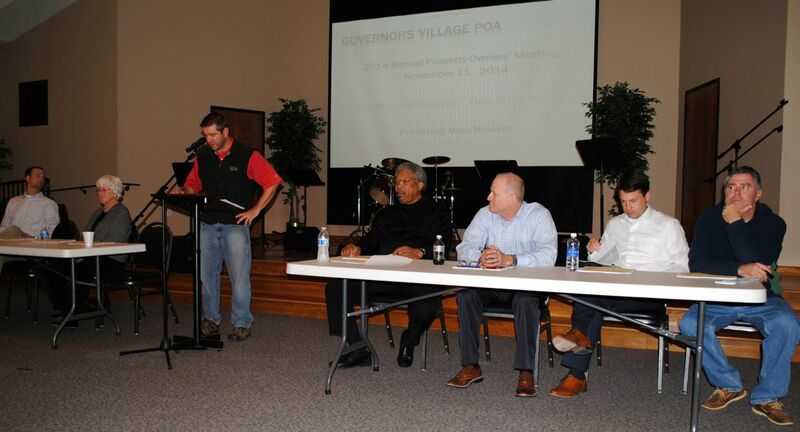 The annual meeting of the Governors Village Property Owners Association (GVPOA ) was held November 11, 2014 at Mt. Carmel Baptist Church. Residents gather for the 2014 annual meeting. 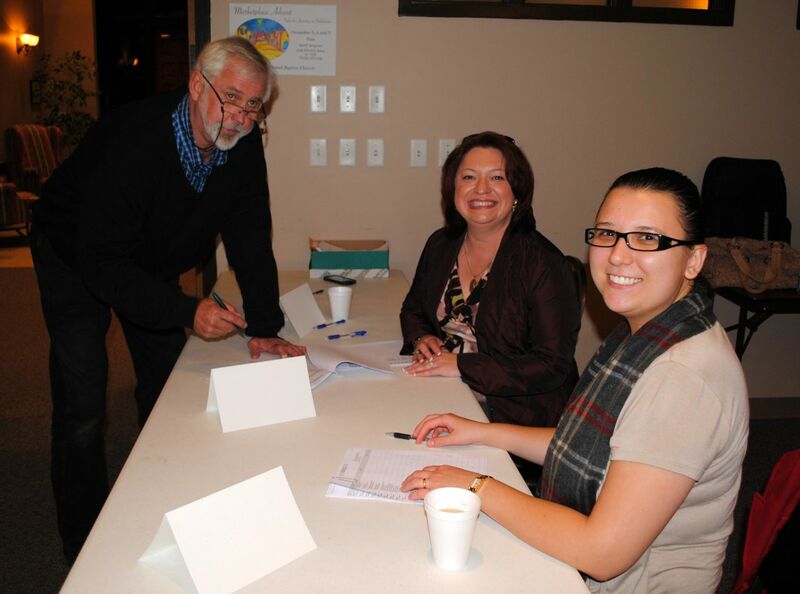 Resident Brian Sawyer is greeted and checked in by Community Manger Alina Cochran and assistant Sandra Bigas. President Wes Weaver began the meeting by welcoming new neighbors to the community. Thirty-seven existing homes were purchased this year. 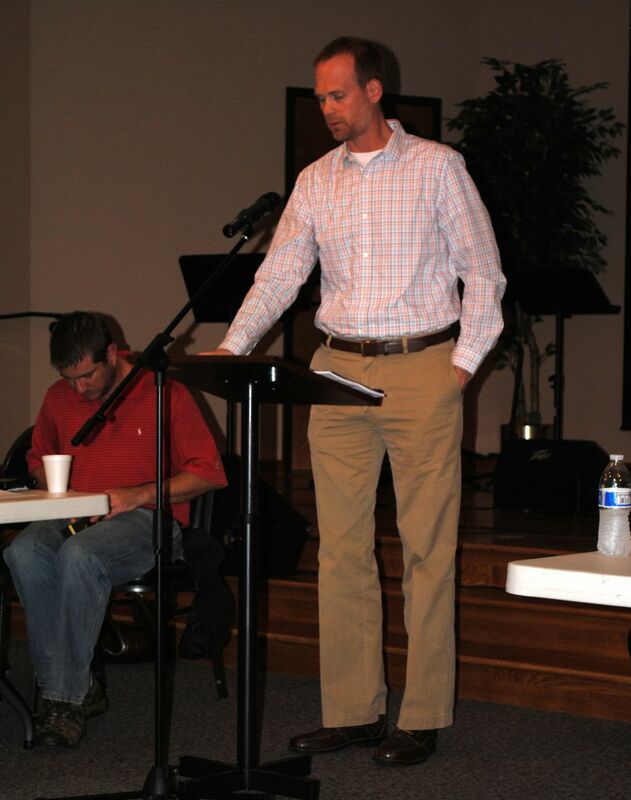 2014 GVPOA President Wes Weaver presided at the annual meeting. Next Wes introduced other members of the GVPOA Board of Directors as well as those serving on the 2014 Townes Board of Directors. The Townes is a sub-association. Wes also introduced the community manger, Alina Cochran, of Talis Management Group. He reminded residents of the core values and community mission that guide the work of the board. 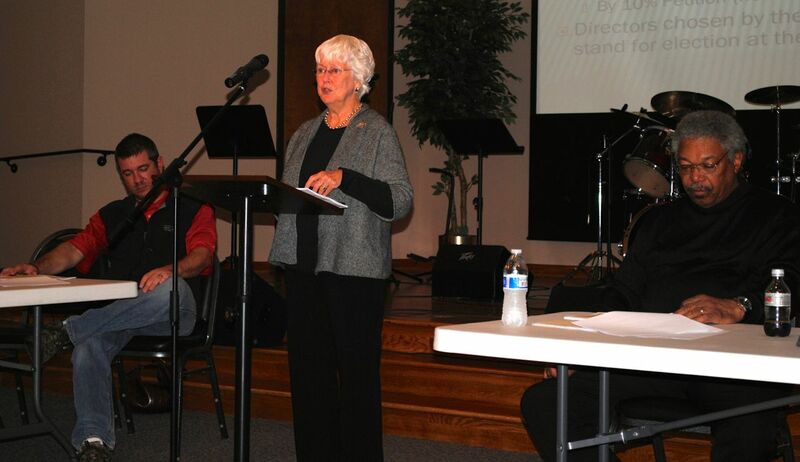 Vice-President Rosemary McGee described the election process to fill four director positions. The slate of candidates presented by the election committee ran unopposed. All four were elected by acclamation. Outgoing director Otto White, who has served 6 years, gave the Board Update. Otto’s report included recreation and grounds improvements as well as an update on the commercial area. Under the new pool contract a maintenance person will clear debris in the mornings. Pool shifts have been changed slightly but open hours will remain the same. Grounds committees have used/planned 2014 neighborhood enhancements that include new plantings, tree replacements, grading improvements and daffodils for spring color. Outgoing board member Otto White presents the Board Update. 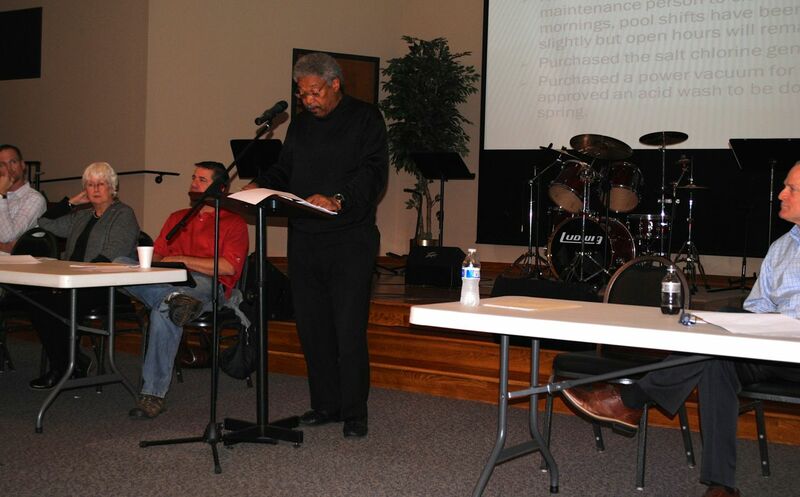 John Eberhard presented the Financial Report. He reviewed the income statement, balance sheet as of the end of October, chart of 2015 budget assessment income by neighborhood, 2015 budget overview and 2015 budget expenses. Dues remain unchanged for 2015. John reported $400,000 Parks and Improvements Loan was paid in full this year. The board is committed to fully funding the reserves to the level recommended by the reserve study goal. John Eberhard presents the financial update. Daniel Guy recognized the many volunteers who serve on the various committees. Special acknowledgments were given to Barry Bassett for his long service working on the pool and to Otto White for his 6 years on the Board. Daniel Guy acknowledges community volunteers who participate on ARB and committees. increasing number of potholes in the streets. Except for alleys in Townes, all streets are owned by Department of Transportation. Residents can report potholes directly as well as alert Talis. Suggestion was made to enlist assistance of Talis in keeping a list of when the proper DOT authorities have been notified. A Forest resident receives clarification on the financial reports. Thanks go to Otto White for his six-year service on the board. Thank you also to the other board members, all of whom will return for next year, joined by newly elected Ted Smith. 2014 GVPOA Board of Directors. Seated left to right: Otto White, Bill Hlavac, John Eberhard. Standing: Rosemary McGee, Wes Weaver, Daniel Guy. Not pictured: Cliff Simpson, Peter DeStaebler. Further details summarizing the work of the 2014 board are available in the slide presentation attachment. Photographs by Ted Smith, Communications Chair and Photographer. This entry was posted in gv Events, gv Photo Essay, gv Photos, gv POA Business and tagged annual meeting, Governors Village Property Owners Association on November 16, 2014 by govvillage. On Tuesday, November 11, 2014 at 7:00 PM the Governors Village Property Owners Association (POA) will hold its Annual Meeting at Mount Carmel Baptist Church located at 2016 Mt. Carmel Church Road Chapel Hill, NC 27517. Please attend this important meeting in order to exercise your rights and responsibilities as a property owner. Sign-in will begin at 6:30 PM. See candidates for director positions and budget draft below. This entry was posted in gv POA Business and tagged annual meeting, Governors Village Property Owners Association on November 11, 2014 by govvillage. 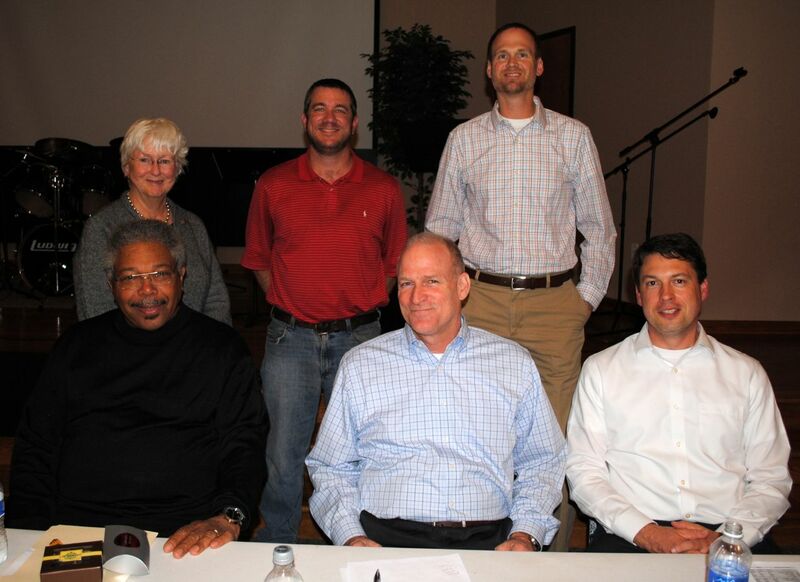 Jo Watta, Rosemary McGee, Wes Weaver, Chris Gamber, Otto White, Terry O’Brien, John Eberhard. Photographs courtesy Ted Smith, Communication Committee Photographer. 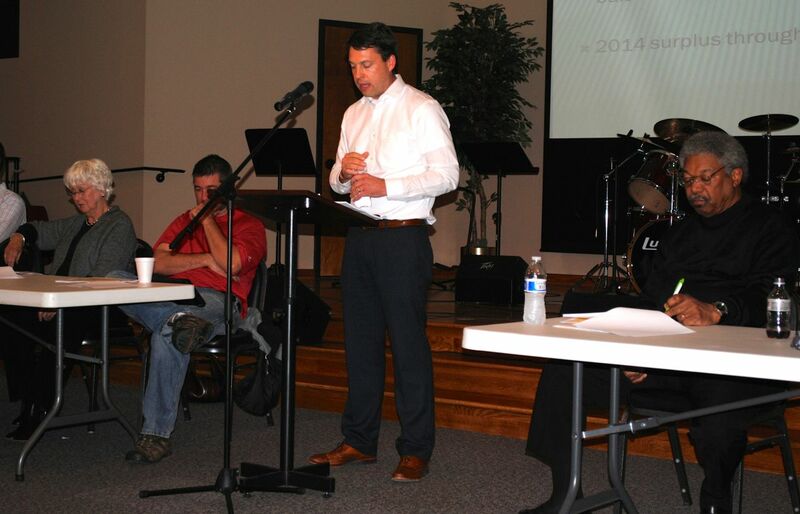 The 2013 Annual Meeting of the Governors Village Property Owners Association was held Tuesday November 12, 2013 at Mount Carmel Baptist Church. Elections were held for three Board of Director positions. Daniel Guy will serve as the Governors Park director, replacing Josephine “Jo” Watta. Another Park resident Clifford Simpson will fill the At-Large seat, replacing Terrance O’Brien. The Governors Lake seat vacated by outgoing co-President Christopher Gamber remains unfilled as no candidates came forward to seek that position. Special thanks are due to members who are leaving the board this year after completing their terms. In 2013 Chris served as Co-President, Lake Director, Recreation and Pool Liaison. Jo was Secretary, Park Director and Social Liaison. Terry was At Large Director, Lake Development Committee Liaison, ARB and Safety Liaison. In other business the 2014 Budget was ratified. The annual assessment will remain at $1,020 for 2014. Volunteers were recognized for their contributions to the community. After a question and answer period the meeting was adjourned. This entry was posted in gv Events, gv POA Business and tagged annual meeting on November 20, 2013 by govvillage.